These beautiful mountains have remained a mythological world of fairy tales for centuries because you can only cross them on rough mountain trails and by going through inhospitable valleys, where city folk have never set foot. Behind a road there is always someone with an idea – in this case, a huge idea because Mr. Christomannos’ project was to connect the city of Bolzano to all the Dolomite valleys, creating the “Great Dolomites road”. This project was accepted by local authorities on August 22, 1897 – meaning, the area was still under the Austrian empire. Works started in the same year and the road was officially inaugurated on September 13, 1909. 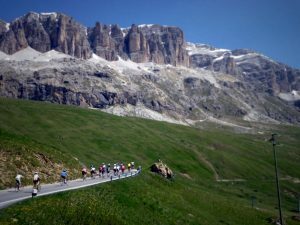 The Passo Pordoi was part of this project and, like all the passes on the Great Dolomites road, it has a really cool characteristic: a gentle climb gradient that touches 9% in just one place and, if you’re not tired, you won’t even feel where this is! Starting from the town of Canazei, just find a nice climbing pace based on your condition. The first hairpins start straight off from the beginning and, if you like to countdown to the top, you’ll be riding 27 of them. 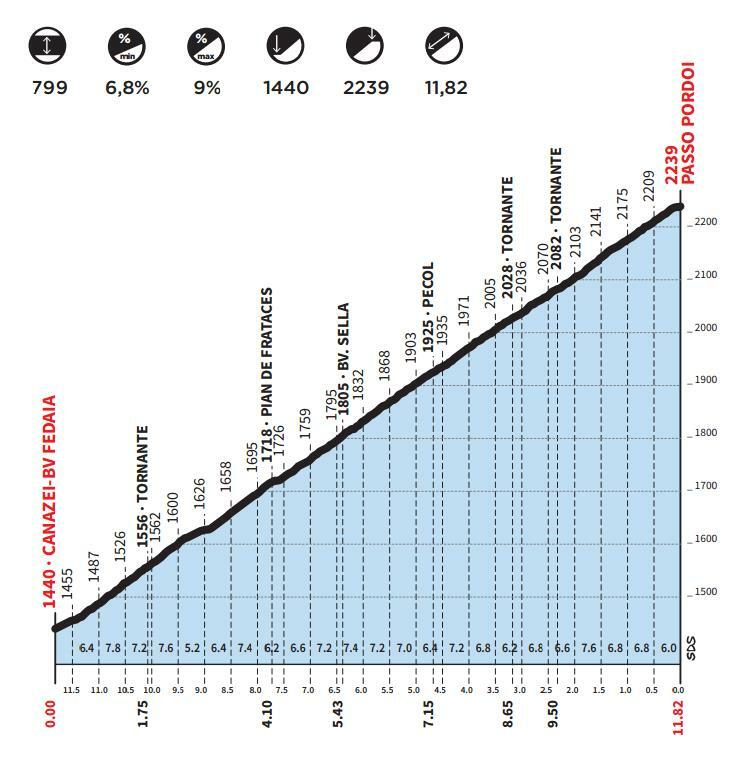 The first 5.5 km are the same as for Passo Sella. At the junction, you go left to start the Sella climb that is a bit harder than the Pordoi. Take the road on the right and continue on a 2 km stretch without any hairpins. This part is perhaps the hardest with a 7 to 8% grade. Halfway up, slightly hidden on the left side of the road, is a fresh water fountain to fill your bidons. As soon you get to the locality of Pecol (first houses) the hairpins start again until you are 9.5 km into the climb, when you will suddenly find yourself out of the forest with amazing 360° views around you. When you notice that there aren’t any trees anymore, you’ll be just 2.5 km away from the top of the Pordoi. 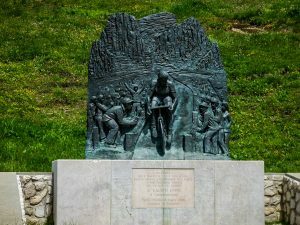 Once you reach it, you’ll see 2 monuments dedicated to cyclists. 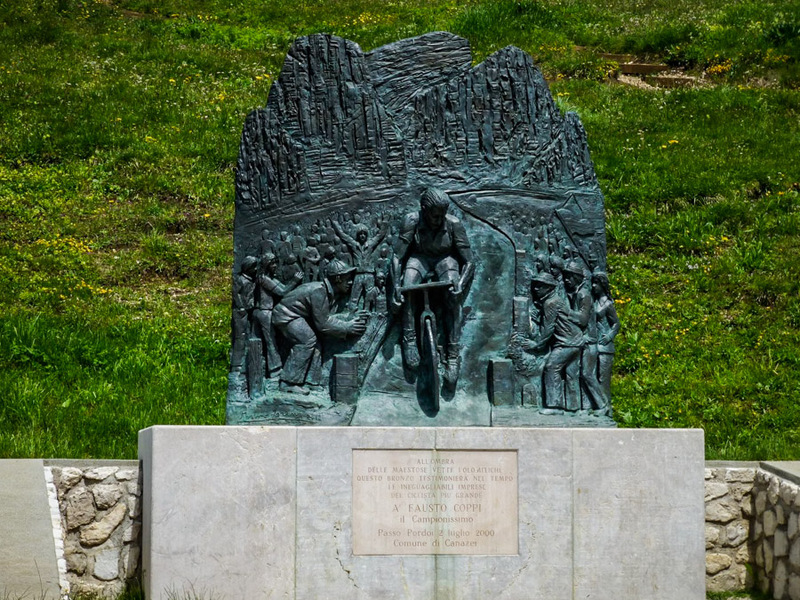 The first one is the Fausto Coppi monument that is located near the gondola station that goes to Sass Pordoi. On the descent, on the right side of the road, is Gilberto Simoni’s road bike set in Dolomite rock. 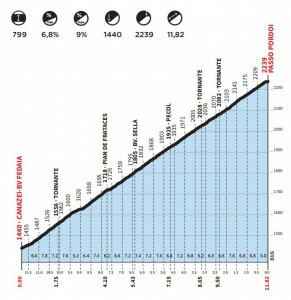 Did this climb also. 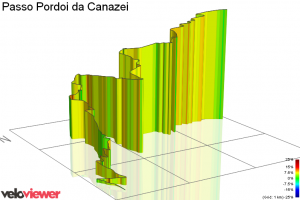 The climb isn’t as beautiful as the Sella from Canazei. From the Pordoi I descended to Arabba and climb the Pordoi again. I can recommend everyone doing the same. The decent from the Pordoi to Arabba is superb, and the climb from Arabba to the Pordoi is also amazing. Much more to see. Leave a Reply to Jeroen Click here to cancel reply.